Notes: Based on the series of light novels by Keiichi Sigsawa, who also wrote the Allison and Lilia light novels. The traveler Kino and a sentient motorcycle by the name of Hermes are dedicated to seeing the world. Together they visit many countries and city-states of the world but always observe a near sacred rule: they will remain only three days no matter what happens or whatever they encounter. As Kino and Hermes follow their journey, they will experience and explore the many varied aspects of humanity. There is no real strong central narrative in this show, nor, for that matter, even a particular plot pattern. Sometimes an entire episode or two will be devoted to one country; on other occasions an individual country might get only ten minutes. The main characters admit during the course of the show that they themselves really aren't sure of the meaning or point of their journey. They have no destination, no particular goal, just a simple general rule they observe about stay length. Despite being a completely episodic show low on action or continuing plot, Kino's Journey ended up being an intriguing title that had me eagerly wanting to see each episode and something I think anime fans looking for something a bit philosophical should give a try. Every episode (or on occasion episode segment) is a sort of philosophical anime meditation on some particular aspect of humanity as expressed through the different cultures, customs, and people of the generally city-state sized countries that Kino and Hermes journey through. Kino is generally a detached and non-critical observer of humanity letting most of these explorations seem more intellectually intriguing or emotionally involving than annoyingly didactic. This isn't to say that everything is always particularly serious. While there are some countries where the darker and more disturbing aspects of the human condition are explored, on occasion some of the lighter and more beautiful aspects of the same are presented. 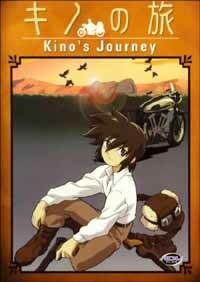 However, I will note that overall Kino's Journey tends more toward the somber and dramatic. Initially, while Kino's near total neutrality and objectivity may, at times, make the character seem less than engaging as the show progresses various different thoughts, pieces, and experiences help the viewer gain better insight into the character. Kino and Hermes spend a lot of time discussing their experiences and the implication which serves both as fodder for thematic exploration and character development. During the final few episodes, the previous characterization work in regards to Kino proved critical to heightening the emotional impact of several scenes. Interestingly enough, Kino and Hermes are, in a sense, a single character. The use of a sentient motorcycle (or motoradd as he is called in the show) allows for several conversations about the meaning of various events and experiences even when there are no other human characters present. I must admit I interpreted Hermes as really just a device simply for that purpose but I wasn't particularly irritated by that fact. Of course, a wide variety of other people from many lands are encountered during the journey. While in some episodes, the emphasis is more on the particular setting or customs, several episodes feature rather solid character development. In some cases, Kino makes an almost cursory appearance and takes back seat to the encountered people who might have their own interesting and emotionally textured story to tell. At times, Kino's Journey felt like a well done science fiction anthology show though the central thread of Kino and Hermes did a lot I think to help personalize many of the encounters during the journey much more than a series of totally detached narratives might have. At the same time, the lack of focus and stronger central connection between the stories slightly dampens the overall impact of the entire series. The very nature of this show, at times, might prove frustrating depending on a viewer's particular taste and mindset. There are several encounters that in any other show would seem like they would portend a future meeting with some of those characters but that is never the case in this show. Many aspects of Kino's background aren't explained and there are a few scenes that potentially imply there is perhaps more to Kino then even the traveler realizes but most of these things are never followed up. In another show, that might have been more irritating but in this title it really is the journey itself that is the emphasis not the destination. Even the show's extremely open ending fit perfectly with its general feel and tone. The character artwork tended toward more simplistic, occasionally stylized, and somewhat cute designs that stand in contrast to the nature of the stories being told. The background and scene work aren't exquisitely detailed or anything of that nature but each individual country is rendered in its own unique way to give it a different feel. Other technical aspects, such as the generally sedate soundtrack and certain specialized visual effects may not be bowling people over with their sheer beauty but they do play a strong part in helping maintain the show's introspective and philosophical atmosphere. An unusual show that may not be for everyone, I found Kino's Journey presented a number of interesting philosophical explorations of the many aspects of the human condition without seeming too pretentious. Recommended Audience: This isn't exactly Requiem from the Darkness, but this show explores both the dark and light sides of the human condition. Some episodes involve some short scenes of intense violence or focus on disturbing thematic material. I would recommend it mainly for older teens and above.